Danielle shows Layla clear Invisalign aligners. Beautiful straight teeth without wires or metal! With more than 15 years of achieving results with teeth straightening and adjusting bites, Invisalign has been proven to be an effective alternative to metal braces. This modern approach to straightening teeth and correcting bite alignment uses plastic aligner trays that are comfortable and virtually invisible, rather than traditional sharp wires and clunky metal brackets. Dr. Parker treats both teens and adults with Invisalign. He will begin by examining your teeth and bite (how the teeth come together) to ensure that Invisalign is the best choice for your individual case. Dr. Parker has completed all the advanced training offered for the Invisalign procedure, and he has successfully provided treatment for over one hundred patients. He’s found that many adults who had braces earlier in life are now experiencing shifting and misalignment. This can be corrected with Invisalign, often in as little as six months when cases require minor adjustments. Correcting a misaligned bite is essential to the success of any teeth straightening procedure. Dr. Parker takes great care to ensure that your bite is properly aligned so that your treatment is long lasting, comfortable and effective. To help you have a beautiful, straight smile, Dr. Parker is offering a complimentary consultation that includes the following. The Invisalign process employs a series of clear plastic trays to gently shift your teeth into the correct position. This treatment takes approximately a year for adults, and for teens about the same amount of time as treatment with braces. There won’t be wires and brackets obstructing your view of your teeth, so you can see the positive changes as they occur. You and Dr. Parker will review the 3D images of your teeth, and he will answer any questions you may have. Dr. Parker takes digital X-rays, external photos and impressions of your teeth, which the Invisalign technicians use to create digital 3D images of your teeth. Dr. Parker uses these images to map out a precise treatment plan. He can show you a virtual representation of how your teeth will move with each stage of treatment, and let you know the approximate length of treatment. Invisalign creates a series of custom-made, clear aligners following the treatment plan designed by Dr. Parker. These aligners are made of a smooth, BPA-free plastic that won’t irritate your gums like traditional metal braces often do. Your aligners will be traded out about every two weeks, with each new set advancing you to the next stage of the treatment. You’ll come in to our office every four to six weeks so that Dr. Parker can keep an eye on your progress. The teen years are frequently well documented with photos of important events such as graduations, proms and first dates. And who doesn’t snap and share a selfie once in a while? Once adult teeth have erupted, teens can have their teeth straightened effectively with Invisalign Teen® clear, removable aligner trays. Invisalign Teen offers the same benefits as adult treatment, with a few added bonuses. Six replacement trays are provided free of charge with Invisalign Teen, and compliance tracking is built into the trays so that you, your teen and your dentist can check how often the trays are being worn. Like the adult treatment, Invisalign Teen aligner trays can be removed to eat, brush and floss. Crooked teeth not only affect the appearance of your smile, they can cause damage to adjacent teeth and create conditions that lead to periodontal disease. 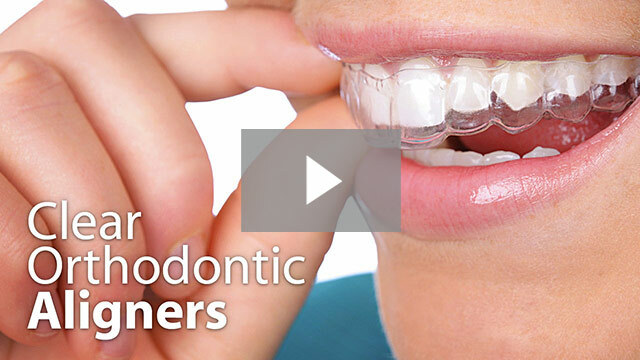 The video below will show how straightening your teeth can also improve your overall health! Following are some of the main conditions Dr. Parker can fix with Invisalign. Invisalign clear aligners were used to straighten this patient’s teeth. Invisalign clear aligners were used to correct this patient’s misaligned bite and teeth. Clear braces were used to evenly space this patient’s teeth prior to placing natural-sized restorations. This patient’s teeth were repaired with Invisalign clear aligners. “After debating about getting braces for many years, seeing the results firsthand on a friend made me decide to move forward. When I met the staff at Parker & Pennington, I felt completely comfortable.